I am ready to bet you will really love the following Atlantis Road offering really spectacular views, unbelievably sharp turns and wild nature. By the way, the following road is in The Guardian’s list of the world’s best road trips. 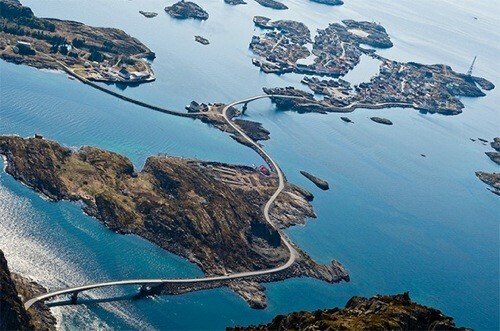 The Atlantic Road is a 8-kilometre long stretch of road between the towns of Kristiansund and Molde, which are the two main population centres in the county of Møre og Romsdal in Fjord Norway. In general, the following road starts approximately 30 kilometres southwest of Kristiansund and ends 47 kilometres north of Molde. In 2005 the following road was named “Norway’s construction of the century” and it was rewarded the status national tourist route. You will be satisfied while travelling this road since there are four panoramic view- and rest areas with facilities along the Atlantic Road. I am ready to bet you would like to know that many tourists choose to travel to the Atlantic Road during the autumn in order to have a look at the raging storms that pound the road.